At 94, he had accomplished so much and lived so fully. Even during his final months and weeks on the planet, he was still playing concerts to packed houses and inspiring people everywhere with his unwavering dedication to using music as a means of raising awareness and fomenting social change. Pete’s gift was for making music and getting others to sing along with him, and he used it not for fame, fortune or glory, but for the good of those who most needed him. Whether he was singing in support of the Civil Rights Movement or the anti-war movement, singing for freedom against the red-baiting of the McCarthy era, singing against apartheid or singing for the environmental movement, he was always out in front leading the charge and showing others what true courage and conviction looked like—in a joyous register. That upbeat, “we-shall-overcome” personality probably played a big role in Pete’s longetivity—research shows that people who think positively tend to live longer, happier lives than those who tend to see the glass half-empty. When I saw Pete play, at one of his last concerts last fall, there was a joyous glow about him that lit up the whole stage, and those of us in the audience would have followed him anywhere. Well, it’s up to us now. Pete has moved on, and we are left to carry on his legacy—to keep singing his songs and working for the positive social change he believed in and created. 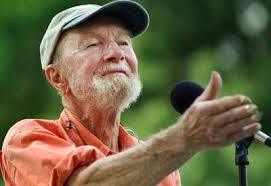 Pete was so deeply engaged with humanity during his lifetime that in death he will still stay lodged in our hearts. His is the kind of soul that will rise into heaven showering sparks and spores of bright beckoning energy, encouraging us to carry his tune, to keep his good spirit alive. Pete, I’ll be thinking of you with love and admiration as I go to greet my students this morning. I hope a little of your sweet, positive, hardworking energy will carry us forward this year, and forever. Jennifer, not that I can approach being a Pete Seegar, but as a former musician, now an amateur poet in my old age, I have written many poems observing my left-wing social philosophy. I’d be glad to share some if you desire. 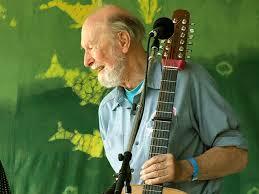 I think when the soul of Pete Seeger passed through the veil, he was welcomed by the joyous and delightful purity of an angel’s laughter. Appreciate your thoughts, Jenny. You are a real part of his tradition. Thanks, Jenny. Appreciate your thoughts. I have been feeling glum lately, not inspired in my teaching (largely due to an unreceptive audience) and disappointed in this country’s lackluster leadership with respect to many issues, especially related to the environment. But today, I am catching up on reading some articles and blog posts, including yours. 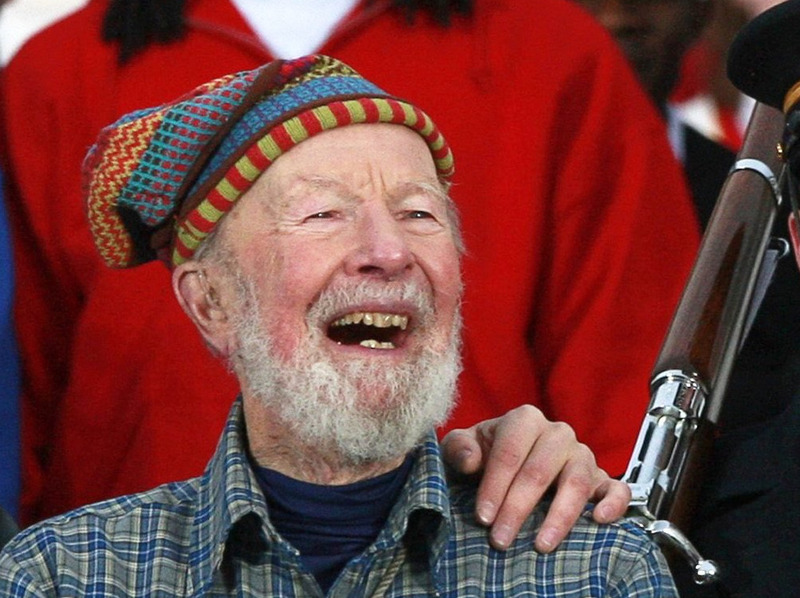 Thanks for reminding me that, even when we are in a lull, we must remember Pete Seeger and Wangari Maathai and Nelson Mandela – inspirational elders who have all left us now – with unfinished missions which must be continued. I realize that if those of us who teach today’s youth, our future, don’t continue to trudge along in this duty, then things will become even more dire. You express it well when you say “we are all Noah now”. Thanks for your reminders. Diane, have you read Charles Eisenstein’s latest book, The More Beautiful World Our Hearts Know Is Possible? He notes how important it is for those of us who are awake to the ecological crisis to connect with each other–it’s not “preaching to the choir,” it’s nurturing each other’s spirits so that we can continue solidly and strongly in our chosen paths. I am glad my blog posts served that function for you today! I feel very lucky with the students I’m working with this semester. Remarkably passionate and aware young people. With your “unreceptive audience,” how can you get under their skin and find the sweet spot where you will be able to wake them up from their media-induced sluggishness? Sometimes it happens when you dare to reveal your own vulnerability, your fears and grief and love. I hate to hear of you “trudging.” See what you can do to dance in front of the class, and get them up and dancing with you! Jennifer, I don’t know that book, but will look into it. Thanks. And you are correct, trudging is the wrong term! That is what it has been feeling like lately, but I must remember to dance. My discouragement was worsened from a recent experience. I am just back from the National Council on Science and the Environment conference on “Climate Solutions” having taken some students with me. I tried desperately to get them to network as many key people where in attendance ranging from the first American woman to walk in space (who is now at NOAA) to James Hansen to Gina McCarthy and lots of researchers and policymakers. And even as we drove home over the bridge in Maryland that crosses the Susquehanna River, a river they know well, a bald eagle flew right over the car hood – so close you could see its eyes – and they wouldn’t be bothered to look up from their smart phones. They could only think about the 100-days-to-graduation party they would head to when we returned to campus. So yes, some spirit nurturing is indeed needed at the moment!